Honor your service or the service of someone you love with our highly detailed and fantastic looking 3D Enhanced Logos for the military branch of your choice. Also available is the optional rank badge, service dates, and title/name that can be engraved on the lower. Create an heirloom commemorating your service that you and your family will cherish for years to come. The enhanced logo almost looks embroidered, and will set your lower apart from any others on the market. Our precision industrial laser will create a masterpiece you will truly enjoy and be proud to show off. Please inquire for sample images or other branches. We generally engrave in a standard block font, but can use most Windows or free fonts available online. Should you want a custom font, please indicate in the engraving locations above what font you want using brackets following the text you want engraved. We do have the ability to cerakote your lower while it is in our shop. If cerakoting, please consider the order of the process so you can get your desired result. If we engrave first, the engraving will need to be deep, and the result will be a very professional looking lower where the graphics/text look factory fresh much like the logos and text on any lower you would buy from your local shop. You will still be able to color fill the logo/text to create a high contrast and sharp looking image. If we cerakote first, we can then go over and remove the cerakoting which will give you a white image through the cerakoted, offering a good amount of contrast. If you are truly going the distance with this lower and going to end up making a form 1 short barreled rifle (SBR) you have come to the right place. While we have it we can perform the NFA required engraving so you will be able to register this as an SBR with the NFA registry. 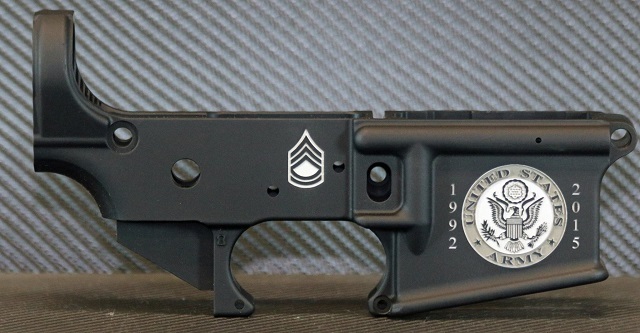 The NFA engraving requirement states it must have the manufacturer name, city and state engraved in a conspicuous location on the lower receiver. Since you are making the short barreled rifle, you become the manufacturer, even if the lower has another manufacturer‘s marking on it, you are still required to add your name (or your trust name if filing under the trust name). We can engrave above the trigger/hammer pins, the magwell, or even underneath the trigger guard for a cleaner overall look. 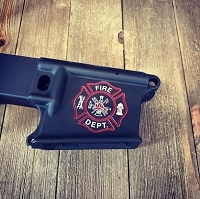 We want your engraving to be a personalized piece of art and to enhance your AR, and a little bit of preparation on your part can help ensure the process goes smoothly and the end result is something you can be proud to display on your rifle. We have prepared a video addressing the common questions on ordering dust covers below. If you have any additional questions please do not hesitate to contact us. *YOU MUST BE 21 TO ORDER ANY STRIPPED RECEIVER. IF UNDER 21 AND SENDING IN A LOWER FOR WORK, IT MUST BE SENT IN WHILE CONFIGURED AS A RIFLE WITH BUFFER TUBE ATTACHED. ADDITIONAL SHIPPING CHARGES WILL APPLY. I have been nothing but pleased with the work that was done and who well the whole engraving looks. I will be a repeat customer for other projects and builds. Thank you for helping me commemorate my 20 years of military service. When I walked into my dealer I wasn’t expecting to see what I have in my hands now. The detail and precision put into this lower is immaculate and I could really not be any happier! For having pride in the branch that I served in and to share that experience into the hobbies I am passionate about, I expected nothing less from this company and they came through more than I imagined. I am so happy of the outcome. I wish I could show a picture. Thanks guys! Did the military service engraving for my fathers burthday, and let me tell you. I was completely blown away at how nice and deep the engraving was.